The zipper closure pillowcase tutorial is complete and ready for you to download/print/use to your heart’s content! I make all of my home decorator pillows this way. 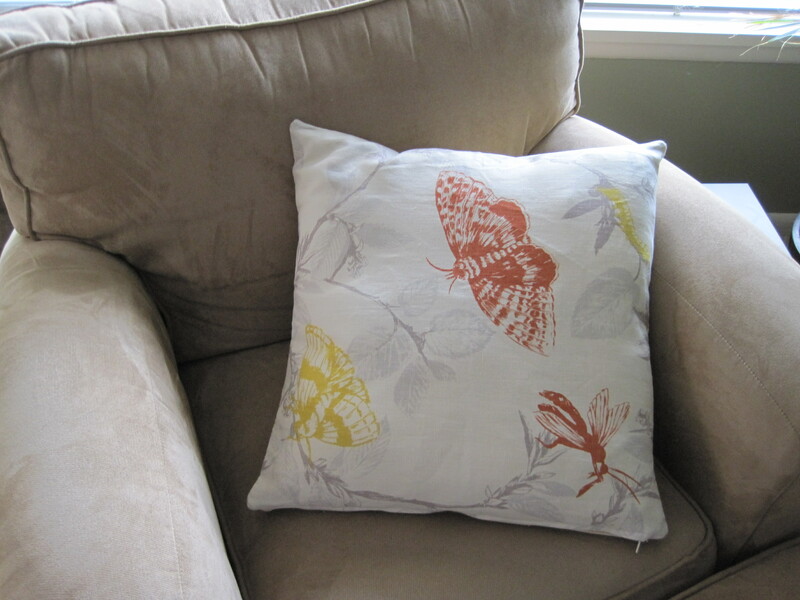 It’s a super easy and quick way to make a washable pillowcase and the result turns out very professional and durable. This is the method my sister-in-law taught me when I first started sewing, and I think it’s just genious! Please feel free to provide me with any feedback. As noted on the tutorial, you’re welcome to use this for personal use, or to sell items made with this tutorial (I don’t claim to have discovered this method!). Do not sell this tutorial, as it is offered for free here (seems obvious, but I had to say it). I’ve been making a list of all my favorite tutorials from around the blogosphere, and I have selfishly kept them all to myself. Not any more! Below you will find some of the most practical, fun and inspiring tutorials out there (according to me…). Check them out. Bookmark them. Plan your spare time around them. NOTE: These are not my tutorials. These are links to tutorials I have tried and found to be great! Click the pictures below to launch the tutorials. I’ll update this list as I find and test new tutorials and publish a link to this post on my Tutorials page. Choosing fabrics colors and placement for a quilt can be a difficult decision. When I started my first quilt, I wanted to be able to “preview” it before it was set in stone (or thread, I suppose). So, I decided to create a digital mock up, using the most basic computer program I had…Paint! The first thing to mention is that I do not have any special software for editing/creating images (such as Photoshop or something similar). This is why I ended up doing this in Paint. If you have a Microsoft-based computer, you should have Paint. If you don’t have this program, I’m sure there are plenty of other great programs out there that will make this possible, but I wanted to find the simplest (and cheapest…Photoshop is pricey!) solution. Open Paint. To find this program on your computer, click the Windows/Start button on your PC, click All Programs, and click Accessories. Paint should be somewhere in the middle (circled below). 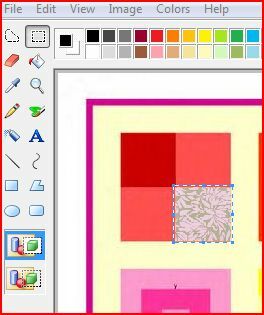 Save the image of your Quilt Pattern to your desktop and right click on the image and click Open with Paint. For me this was easy since I was following a digital Quilt Along. 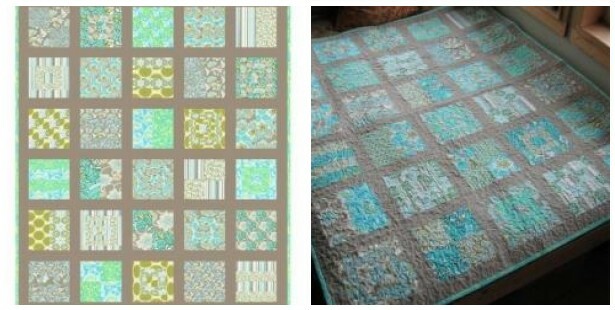 I was able to use the image that Oh, Fransson had posted of the Mod Sampler Quilt as my pattern. If you’re using a pattern you purchased and do not have a digital copy of it, you can either scan the pattern to your computer, or try creating the layout from scratch in Paint (or an equivalent image editing software). Next you need to open your web browser and begin running searches for each of the fabrics that you are planning to use in your quilt. Try doing a Google Image Search and typing in the name of the fabric. You can see that I typed in Daisy Chain Amy Butler and found some good results. I decided to use the one that I circled below. Simply open up the image (you may need to click See Full Sized Image) then right click on the swatch and save it to your desktop. Since you will be saving many swatches to your desktop, I like to rename the image to the title of the fabric. Find each fabric you’re planning on using in your quilt and save each image as a copy to your desktop. If you don’t know the name of the fabric, or can’t find photos online, get out your digital camera, go somewhere with a lot of natural light and try to get some good close-up photos of your fabric. You can use these photos in the same way you would use an image you found online. Open your first fabric swatch in Paint (alongside your quilt pattern which should still be opened in another window of Paint). Highlight the Select tool in Paint (see image to the left). Using the Select tool, highlight a section of your fabric swatch that cooresponds to the shape you are pasting it to. 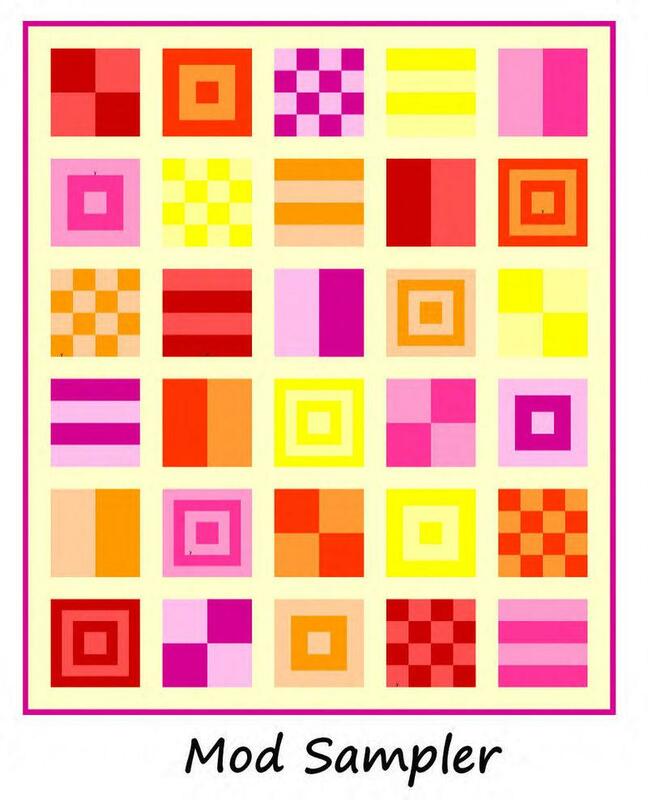 For example, if the first quilt piece in your pattern that you will be using is a square, select a square of your fabric swatch. Don’t worry about the size or scale of the square you select, you will be able to adjust that later. While selecting the swatch, click Ctr+C. Tab back to your other window in Paint, which has the Quilt Pattern open, and click Ctr+V to paste the image to your pattern. Now you can drag the swatch to where you want it and adjust the size to match your pattern. The image above shows just after I have pasted my swatch into my pattern and moved it to the correct place, but before I have resized it to fit the pattern. The image above shows how the piece looks once I have adjusted the size and shape of the swatch to match my pattern piece. Quick Tip: Once you adjust the size/shape of a fabric swatch the be the correct scale needed for a pattern, you can make an exact copy of the swatch by holding the Control key and dragging the swatch to the next needed spot. Repeat these steps until you have replaced every piece in your pattern with a swatch from your fabric. Remember, if you need to paste a long, skinny shape for the binding, just highlight a very long/skinny swatch from the fabric and once you paste it into the pattern you will be able to adjust the length and width. I used this process in my post entitled Help Me Choose as a way to test out different color options for sashing fabrics. I’m so glad I used it too, because I am very happy with how my quilt turned out! I hope this works out for you, let me know if any part of the process is confusing or too complicated. Post your results! I’d love to see what all you creative people come up with! My best friend got married last weekend and I wanted to make her a personalized Emergency Wedding Kit. So, I decided to create a makeup bag that I could fill with all sorts of wedding day goodies. I filled it with floss, a toothbrush, toothpaste, tweezers, lotion, mouthwash, various pain relievers and antacids, and other things she might need on her special day. It ended up looking great and becoming something that she could later use as a makeup bag! I decided that I needed one also, and I created this tutorial as I made mine. I hope you will find this useful and easy to follow! · To create a pattern, cut the following pieces from butcher paper (or whatever you use to create patterns). · From the fusible interfacing, one 9” x 14.5” piece and two 3.5” x 4” piece (cut slightly smaller than the actual fabric piece to ease bunching). · Fuse the interfacing to the fabric that you would like to be the lining of the bag, following the manufacturer’s instructions. If you cannot find fusible interfacing, you can baste the interfacing to the lining using a scant ¼” seam allowance. · Close off the cut edge by hand sewing around the teeth until secure. Knot to secure. · Iron the two 9.5″ sides of the exterior rectangle 1/2″ in. This will prepare the two ends that the zipper will get topstitched onto. On one of the small rectangles (exterior fabric), find the center of the long (4.5″ side) and line it up parallel with the large rectangle, right sides together, as pictured above. 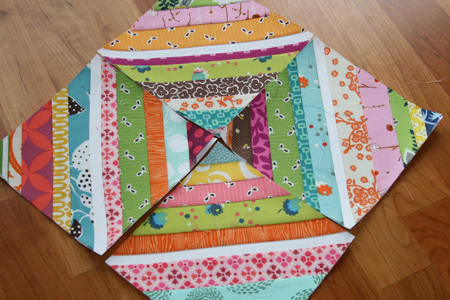 Begin pinning the pieces together, rotating the small rectangle as you go. Repeat with the other side. 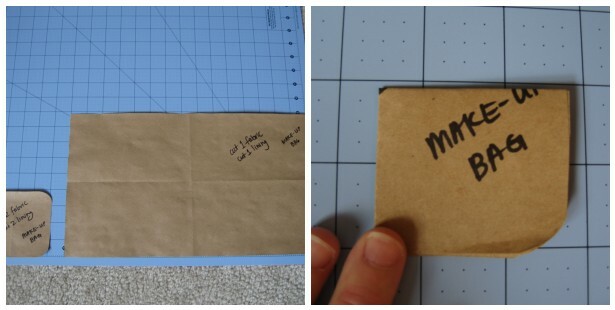 · Sew both sides using a ½” seam allowance. · Using pinking shears, cut away excess fabric (or, cut notches and slits in the seam allowance to ease turning). · Open the zipper up as far as it will go. Turn the bag to inside out. Line up the right side of the bag (the 1/2 seam allowance that you ironed over in step 5, do not catch the rest of the bag) with the right side of the zipper and sew the zipper down (close to the teeth of the zipper – see purple marks in photo above) to the ironed edge of the bag. You may need to maneuver the bag so that all of the bulk of the bag is to the left of the sewing machine, so you can create a nice edge when you sew along the zipper. · Iron down the two 9.5” sizes to make a clean hem. · Sew the lining exactly as you did the exterior fabric. · Fit the lining inside the exterior bag, lining up the zipper seam with the lining ironed over edge. Pin together and hand sew the lining to the exterior along the zippered edge. If desired, topstitch around zipper. · I added a handle and attached it with buttons for interest. Be creative!